In large saucepan, place the pistachios, almonds, and sunflower seeds, and cook over low heat for 3-4 minutes or until fragrant and lightly toasted. Transfer the nuts to a bowl and set aside. In the same saucepan, sauté the green onion, carrot, and celery in the olive oil for 3 minutes or until softened. Add the garlic, cumin, coriander, and cardamom, and sauté an additional 1-2 minutes or until fragrant. Add the basmati rice, stir well to thoroughly combine, and cook an additional 2 minutes while stirring constantly. Add the vegetable or chicken stock, salt, and pepper, and bring to a boil. Cover, reduce the heat to low, and simmer for 10 minutes. Remove from the heat and set aside to steam for 5 minutes. 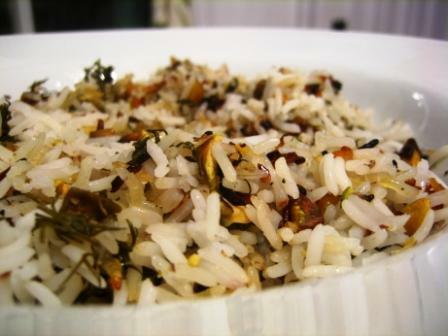 After 5 minutes, remove the lid, fluff the rice with a fork, and stir in the reserved nuts, cilantro, and parsley.